Heavy Duty Staples 23 series (Rapid 23) heavy duty staples. High carbonstaples for for ultra-dense materials. 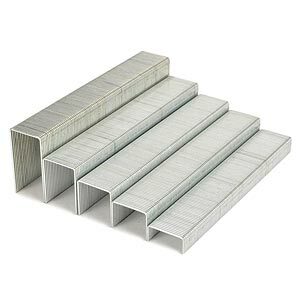 Galvanized, chisel point leg staples, 1,000 / box. Interchangeable with Bostitch SB35, s.f.13 series Swingline Heavy-Duty interchange staples, Kangaro 23. Quantity discounts available if buy 20 boxes or more.